You might not feel there is an imminent need to see your physician but authorities suggest an annual body check is more important than you might think. What does an annual body check entail? Who needs a medical check? Why should you consider getting one? This post will walk you through these and other relevant questions. Let’s get to it! Who Needs a Body Check? Recommendations will differ depending on your medical provider, age and medical condition, but ideally, all adults over the age of 18 should get checked once every 1-5 years. For younger adults with no existing health problems, you may not need to get checked as often. But as you get older, it’s better to get checked more frequently. Researchers at the University of Michigan found that the performance and muscle strength of even master athletes and marathon runners decline after 40 years.3-4 Age takes a toll on heart function too. Studies have confirmed that heart and lung functions decrease with age.5-6 Therefore, it’s important to get a complete health check more regularly as you age. Individuals with existing health problems may need more frequent health checks as well. For example, those with diabetes would see their doctor at least every six months to keep track of blood sugar control, cardiovascular health, vision, loss of sensations, and so on. Make sure to consult with your doctor to find out what’s best for your situation! What’s Included in a Body Check? Here’s what you can expect during your medical check-up. Initial Consultation: Doctors will usually start by getting to know you and your medical history. You can share any question concerns you have related to your health. You may also get questions about ongoing medical conditions, hereditary diseases, lifestyle, and so on. Vitals Checks: Your blood pressure, heart rate, respiratory rate, and temperature will be taken. This will provide important information about your state of health. Physical Examination: The most common examinations cover your heart (cardiovascular system), lungs (respiratory system), your muscle strength and reflexes (nervous system), tummy (abdominal system), skin, vision, and sensations. Depending on what your body check includes, you may also undergo a genital and/or breast examination. Medical Tests: Your doctor can order blood tests including full blood count, liver function tests, kidney function tests, cholesterol and lipid profile, diabetes check (blood sugar and HbA1C), hepatitis check, thyroid functions, urine check, and other checks based on your symptoms or problems. The doctor might also perform an ECG of your heart, a chest x-ray, and other imaging tests if needed. Follow-Up Meeting: The time for results to come back will vary but once they are available, you will be asked to come back to meet with a doctor. During this meeting, your doctor will go through all the findings with you and provide recommendations according to your medical condition. Why Get a Body Check? Here are some benefits to getting a regular detailed health checkup. Healthcare can get expensive, especially for conditions that cannot be covered with insurance. A regular body check helps detect diseases either in their early stages or even before they surface.2,7-8 At this point, the possible treatment options cost less and can subsequently reduce the medical expenditures in the longer run. Everybody wants a better chance of survival. Getting treated earlier on improves that significantly. 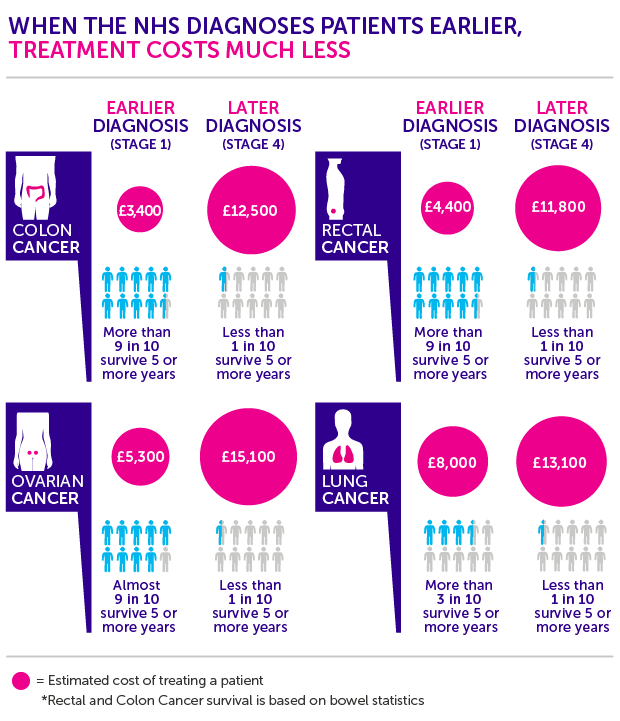 The graphic from Cancer Research UK illustrates that individuals diagnosed with cancer earlier are much more likely to survive at least 5 years longer. And for many common diseases, the chances for successful treatment are much higher as well. The secret to a long life isn’t only in your genes, it’s also in your habits. A regular body check paired with proper consultations will allow you to have a better understanding of your physical condition and a record of your medical history. This information can be provided to professionals so you can receive tailored lifestyle recommendations. Knowing is the first step in taking control of your longevity and health. Your health is precious and the best investment is the one you make into mainlining good health. You should be proactive in keeping your health in good shape and regular body checks can help you achieve that. These health checks can help you from a financial standpoint as well. Talk to your doctor and arrange a health check today! 2. Karl Iglar, et al. Complete health checkup for adults. Can Fam Physician. 2008 Jan; 54(1): 84–88. 3. Faulkner JA, Larkin LM, Claflin DR, Brooks SV. Age-related changes in the structure and function of skeletal muscles. Clin Exp Pharmacol Physiol. 2007 Nov;34(11):1091-6. 4. Liao EY1, Wu XP, Deng XG et al. Age-related bone mineral density, accumulated bone loss rate and prevalence of osteoporosis at multiple skeletal sites in Chinese women. Osteoporos Int. 2002 Aug;13(8):669-76. 5. Kampen WU, Tillmann B. Age-related changes in the articular cartilage of human sacroiliac joint. Anat Embryol (Berl). 1998 Dec;198(6):505-13. 8. Richard Birtwhistle, et al. Periodic preventive health visits: a more appropriate approach to delivering preventive services. Can Fam Physician. 2017 Nov; 63(11): 824–826. 9. Suka M, et al. Effect of annual health checkups on medical expenditures in Japanese middle-aged workers. J Occup Environ Med. 2009 Apr;51(4):456-61. What Should a Full Body Check Cover?